Congratulations to Father Donald Webber C.P. who was elected Provincial of Holy Cross Province last Thursday. A man of many talents, he edited the English translation of the Letters of Saint Paul of the Cross with Brother Laurence Finn C.P. There aren’t many photographs of Father Don available, as he is usually on the other side of the camera! 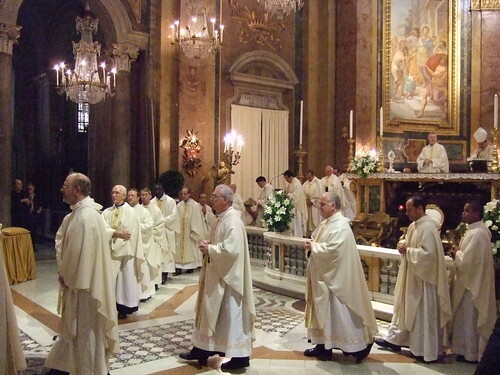 You can just about see him here at the Thanksgiving Mass in Saints John and Paul (Rome) after the Canonisation of Saint Charles of Mount Argus. 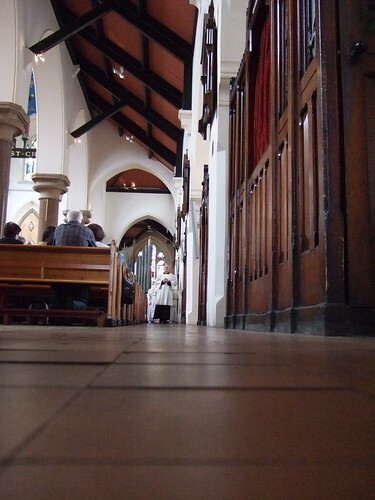 He’s the one in a black habit standing against the pillar on the left side of the picture, lining up a photograph. Father Don, who was based at the Provincial Office in Chicago for the last few years, sent me an e-mail about two weeks ago in which he wrote: Our Chapter is next week, so I’m looking to “retire” somewhere in the Province. -Maybe a retreat center; I really like that ministry. But the other members of the Province had a different idea for his new ministry. I’m sure he will do a fine job. Keep him in your prayers. Holy Spirit Province (Australia, New Zealand and Papua New Guinea) will hold its Provincial Chapter from 1 to 7 July at Holy Cross Retreat, Templestowe, Melbourne. The Province has set up a Chapter Blog where you can read about the preparations and, in July, get all the news from the Chapter floor. 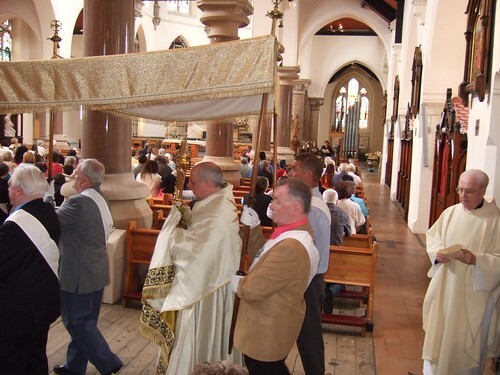 In Scotland, we celebrated the Feast of Corpus Christi last Sunday. 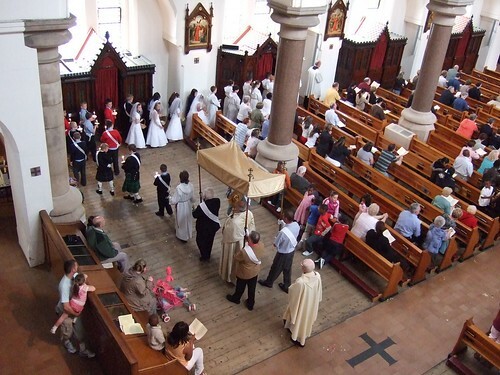 At Saint Mungo’s, after the 12.00 Mass, we had our usual Eucharistic Procession inside the church. 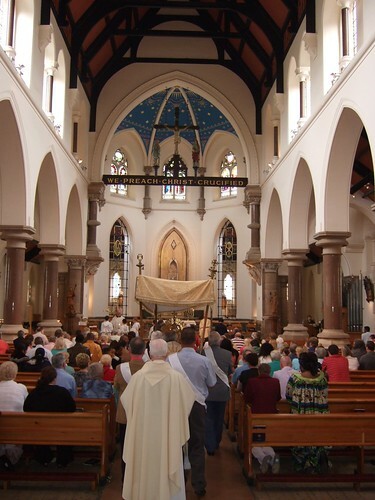 Although Blessed Dominic Barberi reintroduced the public Corpus Christi Procession to England at Stone, Staffordshire, over one hundred and fifty years ago (and Father Tim Finnegan of The Hermeneutic of Continuity followed in his footsteps there a few years ago), Glasgow city centre is probably not ready for it yet. 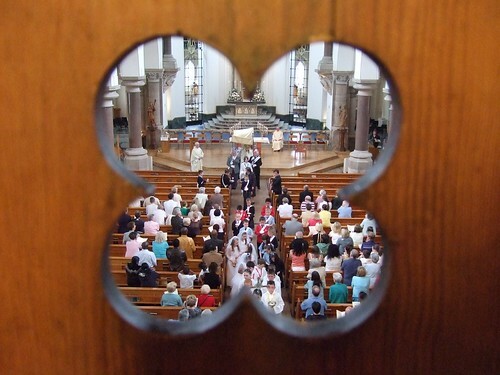 This picture from the organ gallery, which like the others in this post was taken by Thomas Davie, shows the procession taking shape. 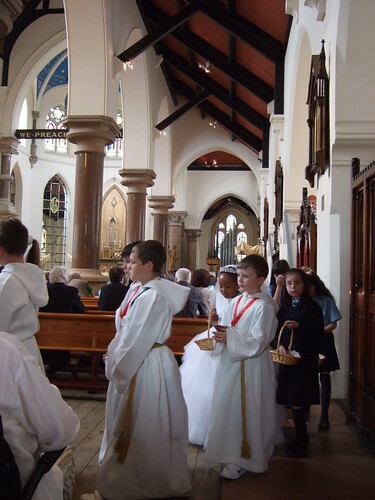 Only the Altar Servers and this year’s First Communicants walk in the procession; if everyone were to walk, the front and back of the procession would probably overlap. 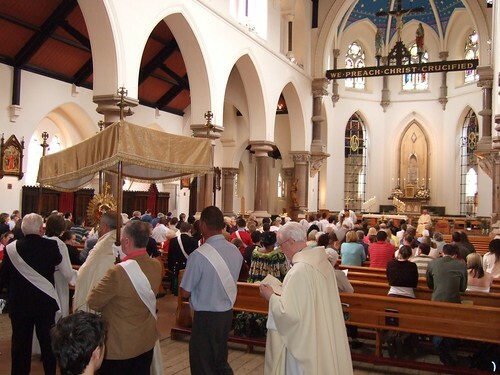 The members of the congregation remain in their places praying and singing as the Blessed Sacrament is carried around the church. Having walked around the ambulatory, passing behind the sanctuary, our Master of Ceremonies, Robert, leads the procession down the other side of the church. 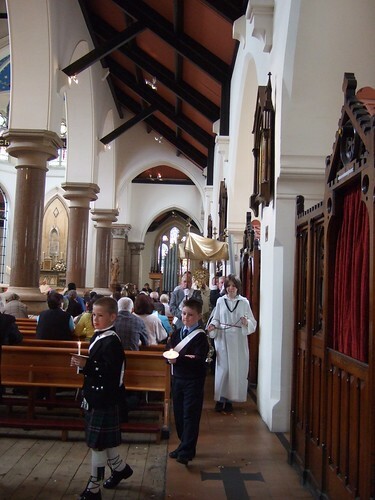 … while the boys carry lighted candles (keeping a safe distance from each other in case they set one another alight). Ronnie has an anxious moment as the canopy negotiates a corner. The Monstrance passes by, with Father Anthony reverently bringing up the rear. 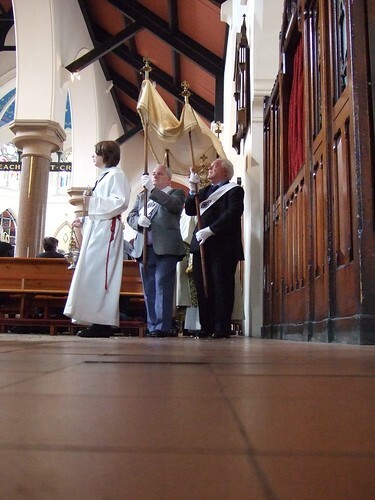 The procession moves back towards the centre aisle to return to the sanctuary. The Eucharistic Procession will conclude at the altar with Benediction. After Benediction, as it was still dry outside, we were able to have a barbecue in the back yard. The First Communicants helped demolish a total of two hundred beefburgers, as well as various other edible items. A new live TV stream was inaugurated at Mount Argus last Sunday and is now broadcasting daily Mass on the internet. You can find it on the website of the Parish of Saint Paul of the Cross, Mount Argus (-see the sidebar, under Saint Patrick’s Province) or, if you have Windows Media Player, just click here. Pope Benedict described Saint Charles of Mount Argus with these words: During his many years of priestly ministry in England and Ireland, the people flocked to him to seek out his wise counsel, his compassionate care and his healing touch. In the sick and the suffering he recognized the face of the Crucified Christ, to whom he had a lifelong devotion. He drank deeply from the rivers of living water that poured forth from the side of the Pierced One, and in the power of the Spirit he bore witness before the world to the Father’s love. At the funeral of this much-loved priest, affectionately known as Father Charles of Mount Argus, his superior was moved to observe: ‘The people have already declared him a saint’. After the Mass, Pope Benedict met the President of Ireland, Mary McAleese. In the afternoon, President McAleese came to the Basilica of Saints John and Paul to venerate the relic of Saint Charles and pray at the tomb of Saint Paul of the Cross. She also visited the monastery to see Saint Paul’s cell where he died in 1775 and to meet the community. 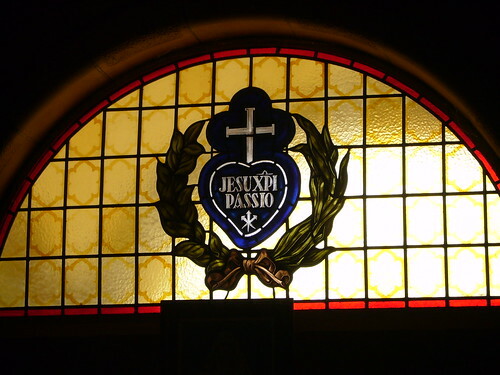 President McAleese was baptised by a Passionist, Father Anselm, and her guiding light was another Passionist, the late Father Justin; both of them are classmates of our own Father Hubert who celebrated his sixtieth jubilee of ordination here in Rome last Thursday.